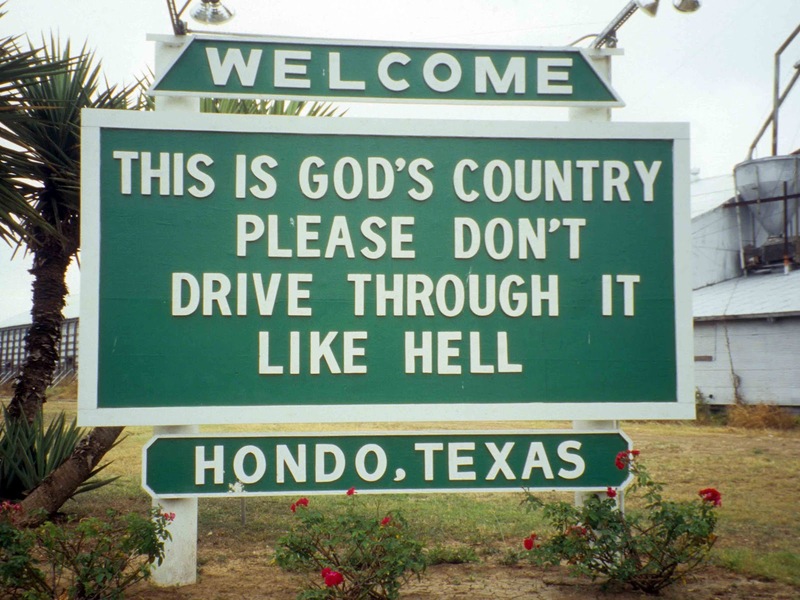 The city of Hondo has one of the most unusual welcome signs in the Lone Star State, or anywhere for that matter. The Hondo Lions Club erected the sign at the city limits in 1930 with the intention of slowing down motorists barreling down Highway 90. The first sign read “This Is God’s Country, Don’t Drive Through It Like Hell.” Because some of the town folk did not like the harsh tone of the sign, the word “please” was added in the 1940s. Local law enforcement could probably speak to the effectiveness of Hondo’s sign. I have certainly learned to respect the slower speed limits as I drive through smaller Texas towns like Hondo on my backroads adventures. There is, however, another sign in Hondo that has unquestionably caused many travelers through town to slow down and pull off the road — and that is the Hermann Sons Steak House sign. The roots of this well-known steak house reach all the way back to 1937 when a fellow named Alvin Britsch opened a restaurant called The Bobcat Grill. The menu in those early days featured hamburgers, homemade chili, and Britsch’s famous “pepper steak.” Britsch later added steaks to the menu, inaugurating the start of the Hermann Sons Steak House. Today, a third generation of Alvin Britsch’s family owns and operates the steak house. I learned about this popular Hondo eatery from my wife Cheryl. 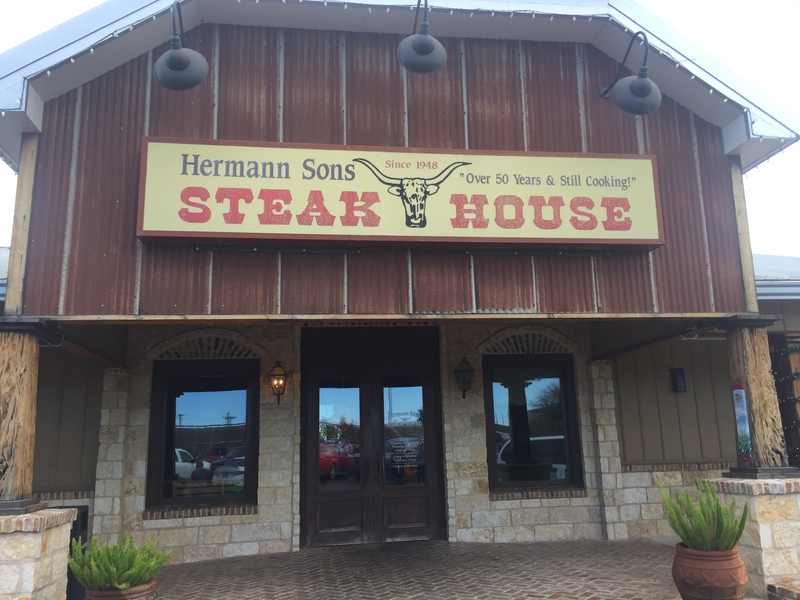 Her family would eat at Hermann Sons every time they traveled to the Hill Country along Highway 90. Her favorite meal — the trademark pepper steak. This dish is more than a meal to Cheryl. It is a nostalgic reminder of happy days of traveling with her family. On our recent visit, Cheryl ordered the pepper steak without even glancing at the menu. As for me, I ordered a burger — in particular, the Big Tex Burger. This big burger is served on a deliciously moist sourdough bun. I added cheese and bacon to my order and a side order of onion rings. 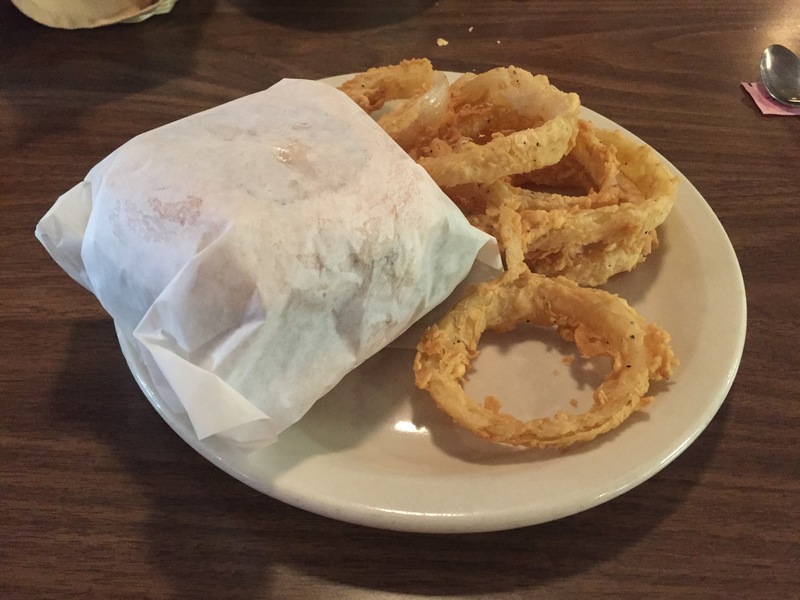 My burger arrived swaddled in a white wrapper with deliciously inviting onion rings on the side. I unwrapped the behemoth and cut it in half to make it easier to eat. The burger was absolutely delicious. The uneven and crumbly patty was cooked to perfection. The sourdough bun held the contents together well without falling apart. 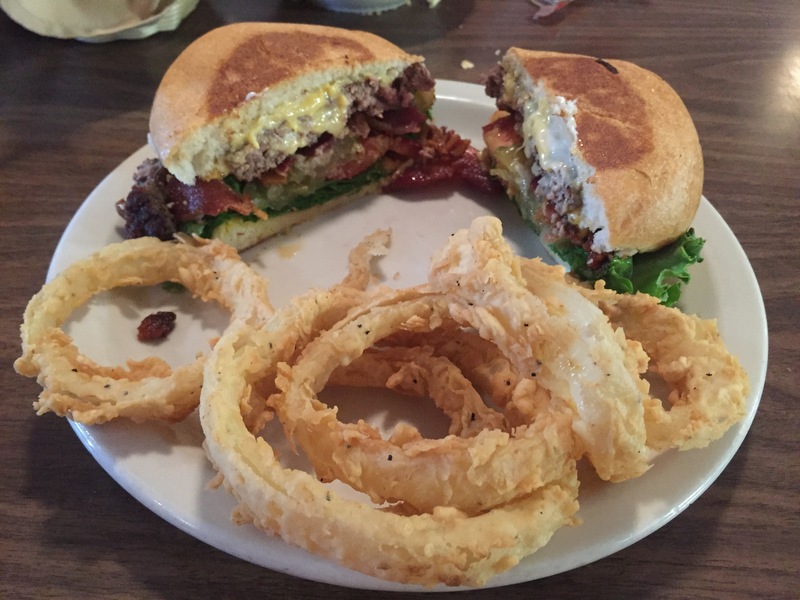 And the onion rings were oh-my-soul amazing. All of this and a cold glass of iced tea made for a perfect meal. I should also mention that the wait staff was friendly and attentive. A good meal and a friendly wait staff certainly make for a memorable dining experience. 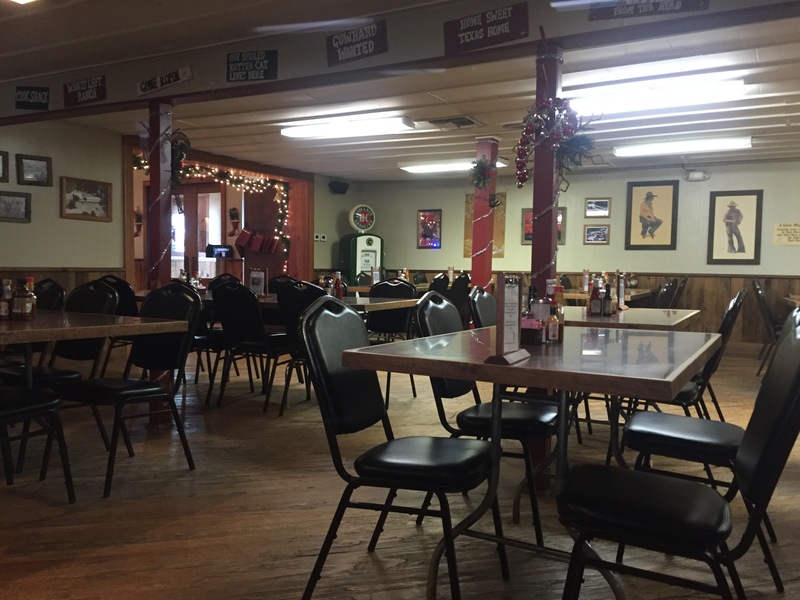 If you find yourself headed west of San Antonio on Highway 90 any time soon, make it a point to time your trip so that you can stop for lunch in Hondo. And remember — don’t drive like hell through Hondo. 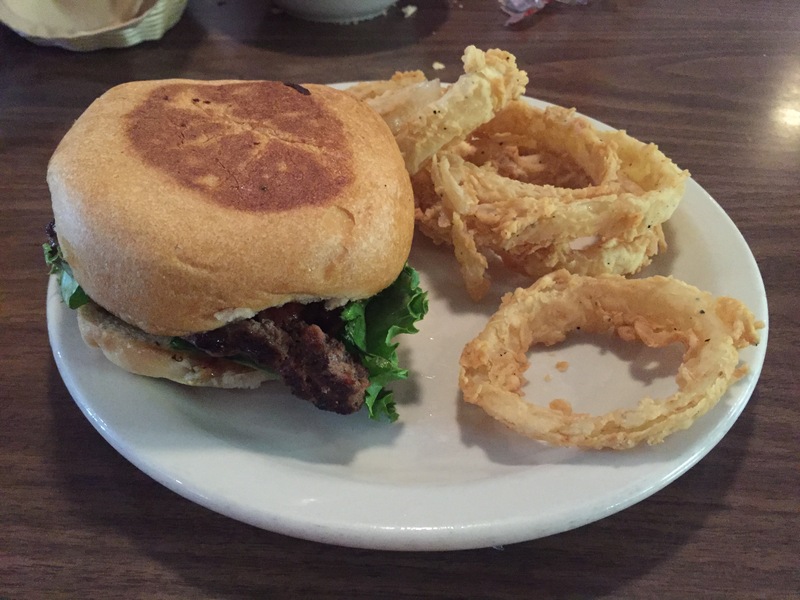 Instead slow down and pull into Hermann Sons Steak House and enjoy a heavenly good meal! This entry was posted in Places To Eat and tagged Hermann Sons Steak House, Hondo. Bookmark the permalink. I have eaten at Hermann Sons as well. We stop there often on our fall hunting trips. You just made me want to go back again!! I too look forward to eating there again this year. Delicious food.